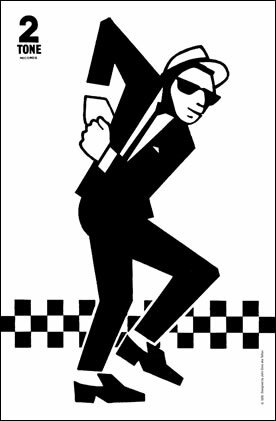 The 2-Tone style and art was created by Jerry Dammers (aka The General) of The Specials but many people played their part in the 2-Tone journey from the beginning to the end of that era – the music and art live on. 2TonePosters.co.uk reflects the part John Sims (aka Teflon) played in the development of the 2-Tone visual identity, as a graphic designer and as art director during his time with Chrysalis Records. This was under the creative influence of Jerry Dammers which led to John’s designs. The Specials first album ‘Specials’ and second album ‘More Specials’ sleeve cover designs were photographed by Chalkie Davies and designed by Carol Starr. The albums were significant in the development of the 2 Tone style from Jerry’s ideas. Teflon oversaw the artwork production. Davies and Starr also took most of the photography for the third album ‘In The Studio’. The stark black and white much acclaimed line style won Teflon a Design & Art Direction Award in 1981 for The Specials single Rat Race. The quad sized Rat Race poster was displayed in the D&AD exhibition at the Design Council in Haymarket, London. Teflon was also involved with some of The Specials and The Selecter promotional videos with Director Martin Baker of Rock Biz Pix and won a Record Business Co-Directors Promotional Video Award with Martin Baker for The Specials single “A Message To You Rudy”. The Chrysalis creative team at this time also included and was led by Creative Director Peter Wagg, Designer David Storey and PA & Video Co-ordinator Carole Burton-Fairbrother. David and John formed a good friendship at Chrysalis which has continued through the years working on various projects. They worked together on The Specials single: Ghost Town and The Selecter album:Too Much Pressure. When The Specials split up, John designed the first Fun Boy Three album sleeve for then ex-Specials Terry Hall, Lynval Golding and Neville Staples. John then left Chrysalis to join Zomba and Jive Records and passed the design baton for the second stage of 2-Tone and The Special AKA and FBT to David. More will be added to 2TonePosters.co.uk in time, from the John Sims (aka Teflon) portfolio, 2-Tone collection and memorabilia. Stories associated with the 2-Tone scene and graphics will also be published here in the future so check back soon.